During 2018, 534 passengers died in commercial aircraft accidents. The death toll was much worse than the previous year, with 13 fatalities in plane crashes, and represents a sharp increase on the recent average. In its Civil Aviation Safety Review for 2018, the Dutch safety consultancy To70 records 160 accidents involving larger passenger aircraft commonly used by most travellers; military flights, private flights, cargo operations and helicopters are excluded. In 147 of the crashes – 92 per cent of the total – nobody died. Of the remaining 13, the biggest aviation tragedy was the loss on 29 October of an almost-new aircraft belonging to Lion Air of Indonesia. The Boeing 737 Max had just taken off from the capital, Jakarta, heading for Pangkai Pinang just north of the island of Sumatra. The pilots struggled to control the jet before it crashed into the Java Sea with the loss of all 189 on board. The accident investigation concluded the aircraft was not fit to fly because of a faulty airspeed indicator, which had been repeatedly reported but not properly fixed. A small Russian carrier, Saratov Airlines, was involved in the first major accident of the year, on 11 February. The flight from Moscow to Orsk crashed 50 miles south of the Russian capital with the loss of all 71 on board the Antonov An-148 jet. A week later, an ATR 72 propeller aircraft belonging to Iran Aseman Airlines crashed an hour into the daily flight south from Tehran to the city of Yasuj. Sixty passengers and six crew died when the plane went down in the Zagros Mountains. The ninth fatal accident in eight years in Nepal took place at Kathmandu Airport on 12 March. A Bombardier Dash 8-Q400 propeller aircraft belonging to US Bangla Airlines went off the runway after landing from Dhaka. It followed confusion between the captain and air-traffic controllers over the direction for landing. Fifty-two of the 71 people on board died. The 39-year-old plane was operated by the Mexican carrier Global Air on behalf of the national airline, Cubana. Shortly after the accident, Global Air was grounded. The only fatal accident in Europe involved an 80-year-old aircraft: a vintage Junkers Ju-52 on a sightseeing flight in Switzerland on 4 August. The investigation into the loss of 17 passengers and three crew aboard the three-engined aircraft is continuing, but it is believed that the unusually hot weather may have been a factor. During 2018 there were three single-fatality air tragedies, all involving highly unusual circumstances. On 16 April, Southwest Airlines flight 1380 departed routinely from New York La Guardia for its home base at Dallas Love Field. Part of the port engine of the Boeing 737 disintegrated in mid-air, puncturing the skin of the fuselage. Jennifer Riordan, a mother-of-two who was sitting in seat 14A was partially sucked out of her window. Although other passengers held on to her, she died from her injuries when the aircraft made an emergency landing at Philadelphia. Jennifer Riordan died after being partially sucked out of a shattered plane window following an engine explosion. Tammie Jo Shults, hero pilot of Southwest 1380, kept calm and saved her passengers. Marty Martinez, left, appears with other passengers after a jet engine blew out on the Southwest Airlines Boeing 737 plane. A National Transportation Safety Board investigator examines damage to the engine. Jennifer Riordan, a 43-year-old mother-of-two. The Southwest Airlines jet sits on the runway at Philadelphia International Airport after it was forced to land with an engine failure. Pennsylvania Game Commission employees recover a piece of the Southwest Airline engine covering that landed in Penn Township, Berks County. Tammie Jo Shults was hailed a hero by passengers. The window that was shattered. The exploded engine of Southwest Airlines flight 1380 during the flight from a passenger’s window. US Navy Lieutenant Tammie Jo Shults in front of a Navy F/A-18A in 1992. Damage to the Southwest Airlines plane after Jennifer Riordan died when the jet blew an engine at 32,000ft. Emergency personnel monitor the damaged engine. Until that event, Southwest Airlines had flown 1.8 billion passengers with no fatal accidents in its 47-year history. On 10 August, the strangest loss of the year involved Richard Russell, a ground service agent for Horizon Air, based in Seattle. The 29-year-old stole a Bombardier Q400 from the airport and took off without permission. He flew some complicated stunts before dying when the aircraft crashed south of Tacoma. It was the only incident classified by To70 as “unlawful interference” during 2018. 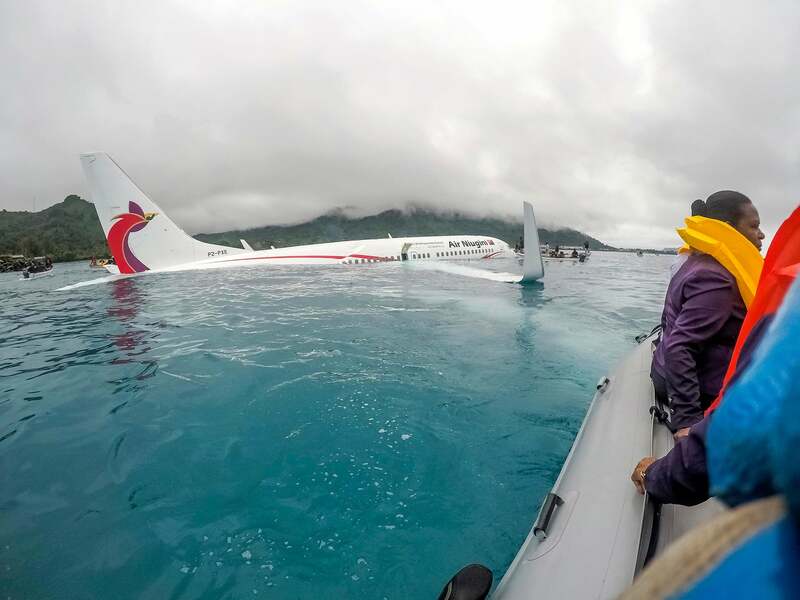 One person died on 28 September when an Air Niugini Boeing 737 from Pohnpei crashed in a lagoon on the Micronesian island of Chuuk. Initially it was believed that all the passengers and crew aboard had survived. But when a second search of the half-submerged cabin was carried out by divers, the body of Eko Cahyanto Singgih was discovered. Adrian Young, senior aviation consultant for To70, said: “Sadly, the historical lack of fatal civil aviation accidents involving large turbojet-powered passenger aircraft in 2017 was not to be continued in 2018. “In fact, the number rose to slightly above the most recent five-year average. The UK and Ireland continue to have outstandingly good safety records. Since the Southwest Airlines tragedy in April, the two airlines which have carried the highest number of passengers without a fatal accident are Ryanair and easyJet. The 30th anniversary of the last fatal accident involving a UK airline, the Kegworth crash of a British Midland Boeing 737, is on 8 January 2019.